Student members of MSU Law’s Michigan Leadership Initiative (MLI) regularly meet and gain insight from respected alumni and esteemed professionals. 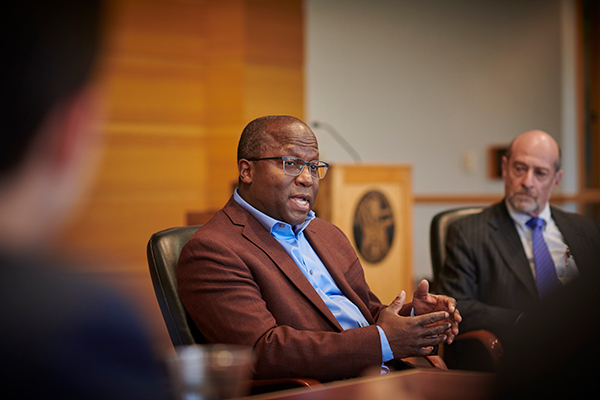 On October 26, the students sat down with Lawrence Oliver, ’91, who serves as Chief Counsel of Investigations for The Boeing Company. For Oliver, going to law school was never in his original plan. On the contrary, he studied industrial engineering at Purdue University and even accepted a job offer at General Motors upon graduation. He worked there for nearly five years, but during that time he realized his desire to learn more about labor relations after working with union workers as well as handling collective bargaining agreements. He felt compelled to go to law school. “It was like a light went off,” Oliver said. He believes that working before law school helped him to determine what he really wanted to do and where he saw his future. He started out at Detroit College of Law (DCL) as a part-time student, continuing his job at GM while working toward his JD. When Oliver was awarded the Detroit College of Law Trustee Scholarship as a law student, it allowed him to pursue his degree full time. “It turned out to be the best decision that I could make. Entering the education and profession of law and going to Detroit College of Law was the perfect fit for me,” Oliver said. At Boeing, he supervises 13 lawyers across the country who are responsible for conducting investigations on potential civil false claims, anti-corruption, and other allegations that may come out against the company. Prior to his current position, Oliver said that serving as a federal prosecutor was one of the highlights of his career. “My third year at DCL, I was an extern at the US Attorney’s Office in Detroit and worked in the criminal division. I fell in love with what they did,” he said. “I would shadow the prosecutors and I remember going into some of their trials and they were prosecuting Detroit gang members.” He admired the prosecutors’ control in the courtroom, and he knew as a student that he wanted to be able do what they did – and he did. He worked as a criminal federal prosecutor for almost five years, during which time he “put some pretty mean people behind bars,” he said. Oliver believes in the effectiveness of confidence with humility when it comes to personal achievement in the legal field, “I don’t think I’m better than anyone, but I don’t think anyone is better than me,” he said. While he’s good at his job and he enjoys it, he also knows the struggle of balancing the demands of the work with two of his highest-priority roles: husband and father of three. His children are grown now, but when they were young, he made sure they knew that his heart was at home with them – even when the rest of him was at the office.